A hardy shrub or small tree which can eventually reach up to 8m tall. Flat, single, white flowers, with yellow stamens. The petals are occasionally tipped pink and the flowers are strongly scented. A vigorous, upright habit. Flowers in October/November. Camellia oleifera occurs widely across southern China and Vietnam, and is the species that for hundreds of years has been cultivated for producing oil from its seeds. 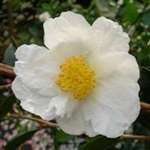 It is very similar to varieties of Camellia sasanqua, and has often been confused with Camellia sasanqua 'Narumigata'. A hardy shrub or small tree which can eventually reach up to 8m tall. Flat, single, white flowers, with yellow stamens. The petals are occasionally tipped pink and the flowers are strongly scented. Grows well outside in the south. Flowers in November/December. Plant arrived intact and healthy, excellent specimen. Obviously proffessional plant experts, would definetly do business with them again should i need any other plants. Makes a welcome change to come across people whose website is a genuine representation of what they are selling.